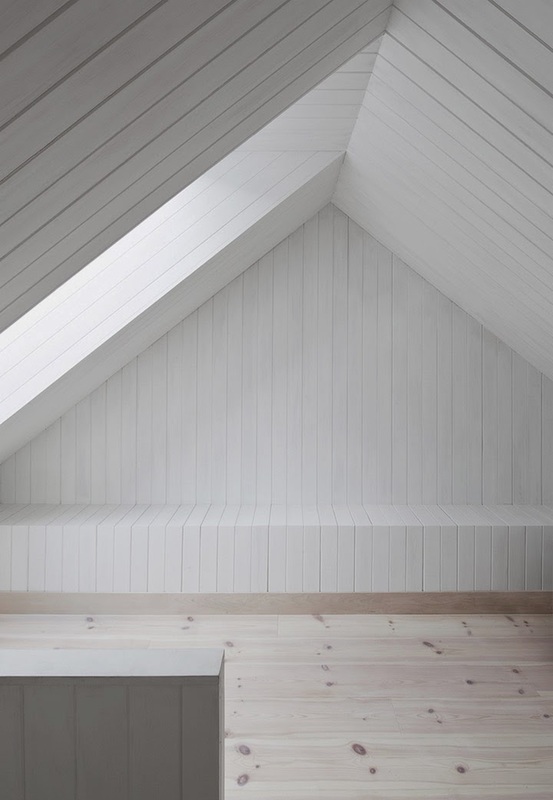 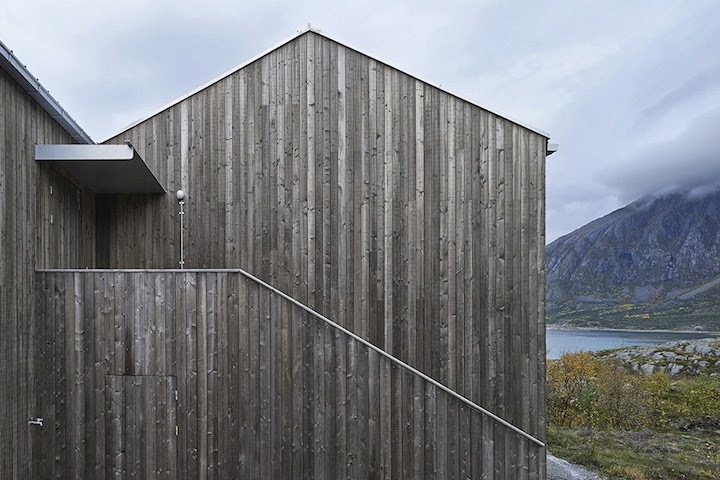 Stockholm based Kolman Boye Architects designed this summerhouse in Vega, Norway, that references weathered Norwegian boathouses. 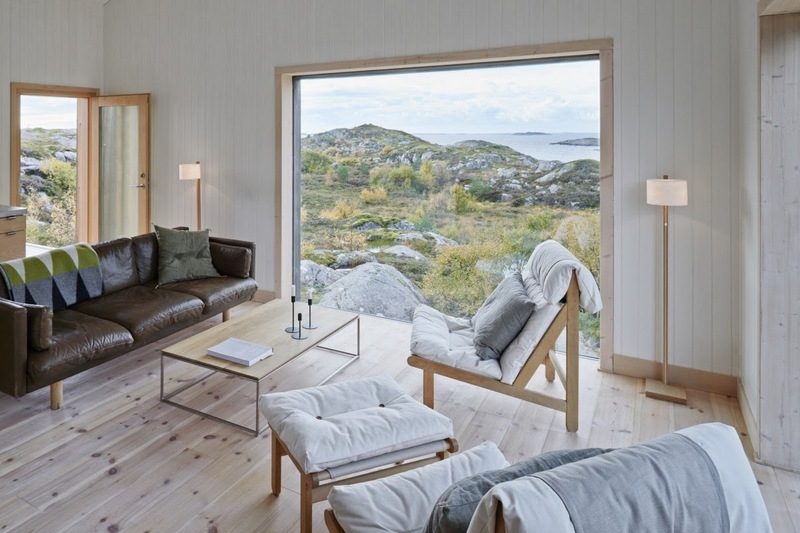 Located on the island of Vega, in the Norwegian archipelago close to the polar circle, the house sits on the uneven terrain of a rock beneath a granite shoulder. 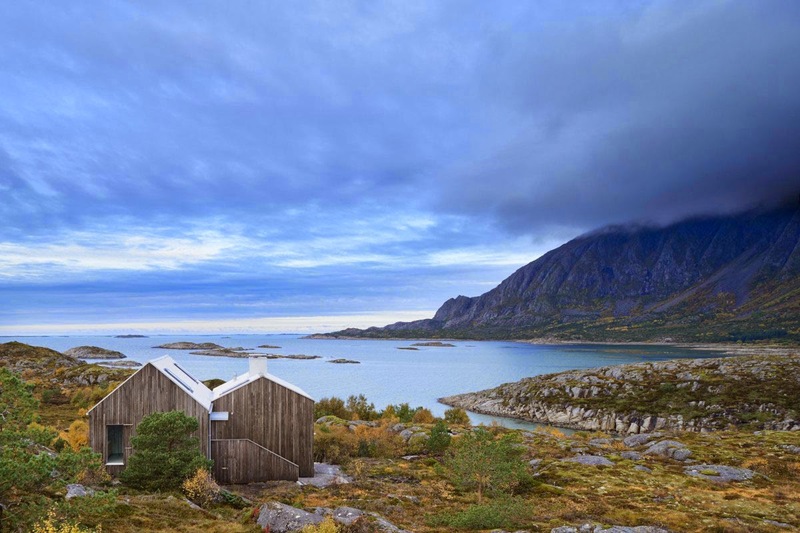 The wooden structure resembles traditional sheds in the form of a contemporary pair of cabins with a distinctive presence and the use of simple materials and gabled profiles. 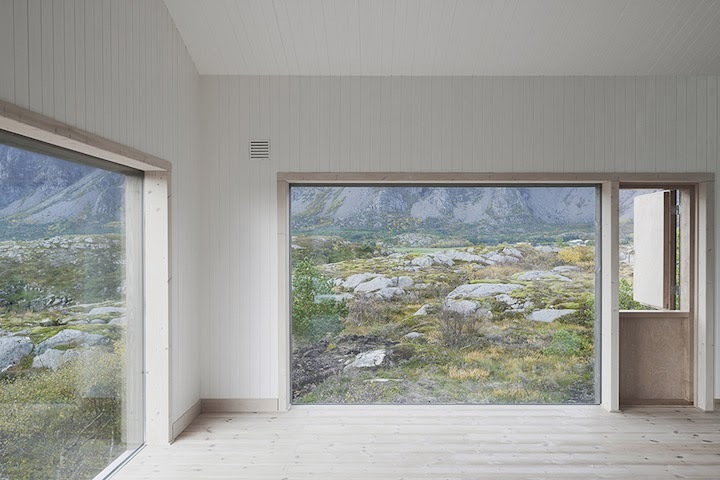 Large windows face panoramas of the Norwegian Sea, the mountain range and the bedrock on three directions. 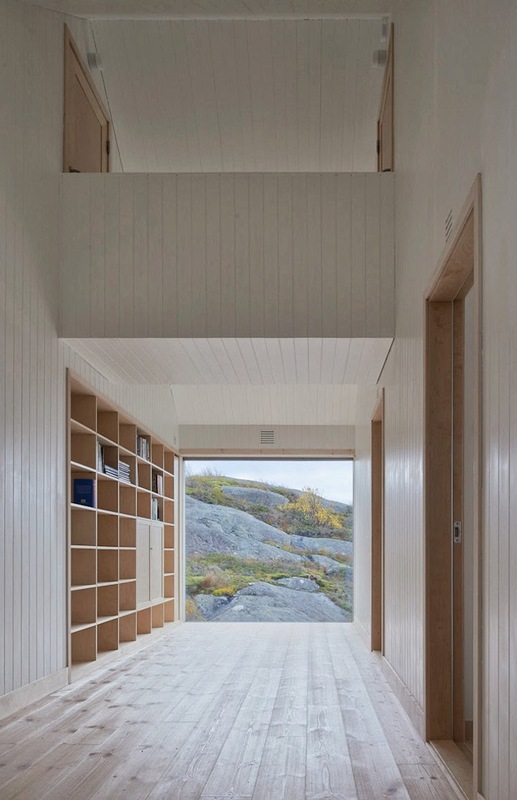 Pine wood is used throughout the building, with the addition of birch joinery details. 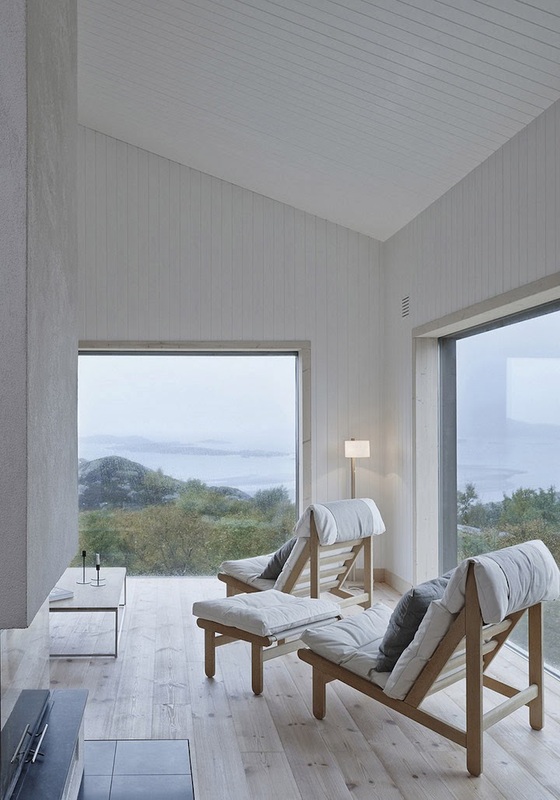 Exterior walls are left exposed, while in the minimalist interiors, surfaces are painted white. 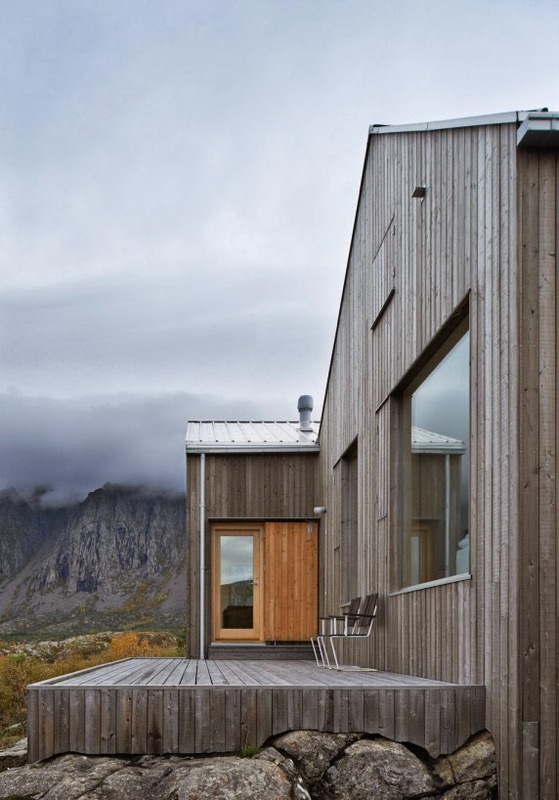 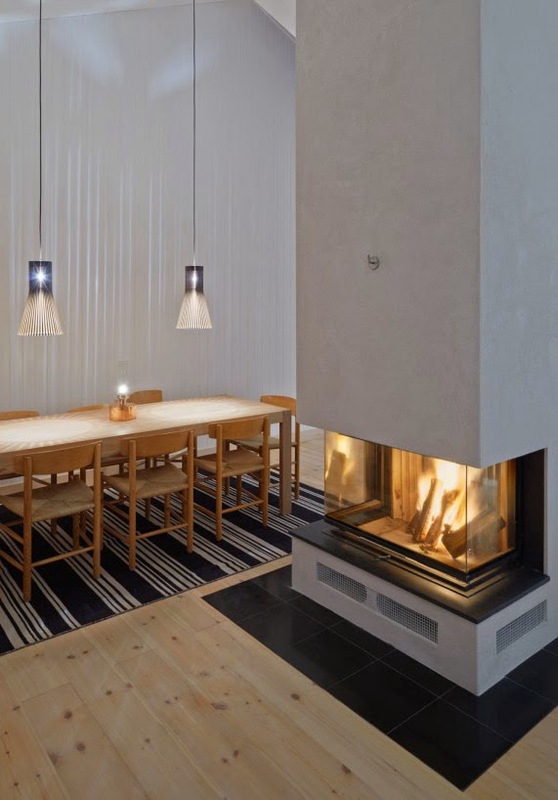 The house stands on the island of Vega in the Norwegian archipelago not far from the polar circle. 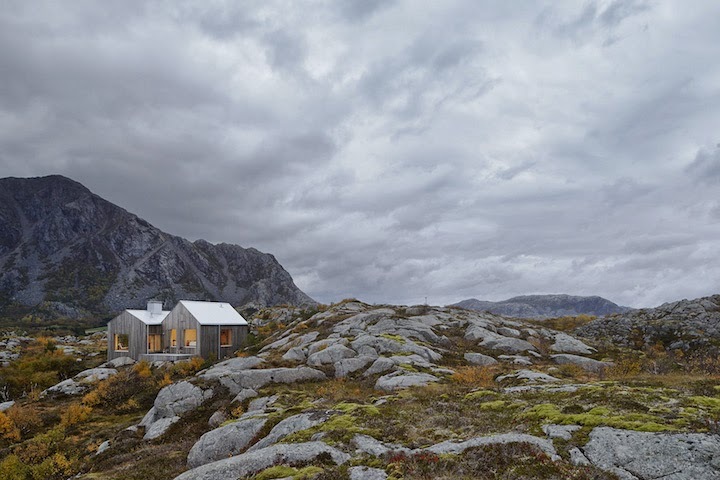 The site is distinctive for its grand and harsh northern landscape with wide panoramas of the Norwegian Sea and the jagged mountains rising from it. 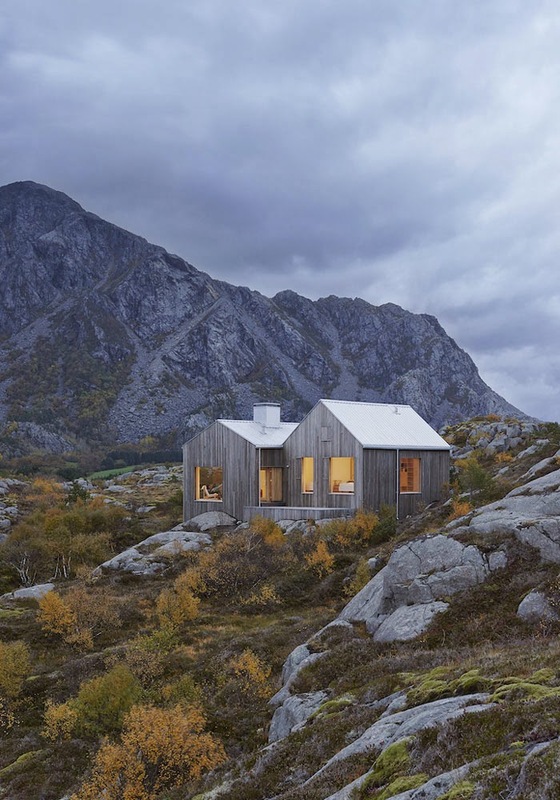 Seemingly growing from the landscape, the house sits on a rock beneath a granite shoulder negotiating the uneven terrain. 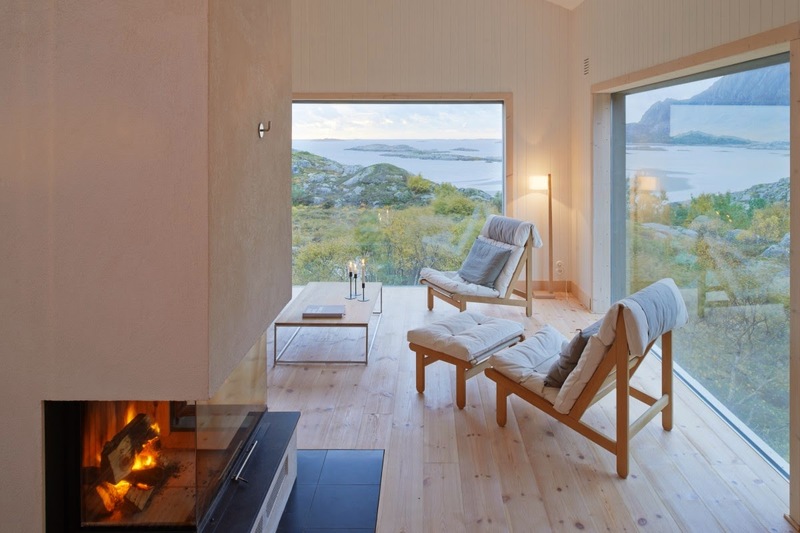 As not to disturb the dominant view towards the sea, access to the house is given through a narrow natural ravine densely grown with gnarled birch shrubs and laid out with sea-sand from the nearby shore. 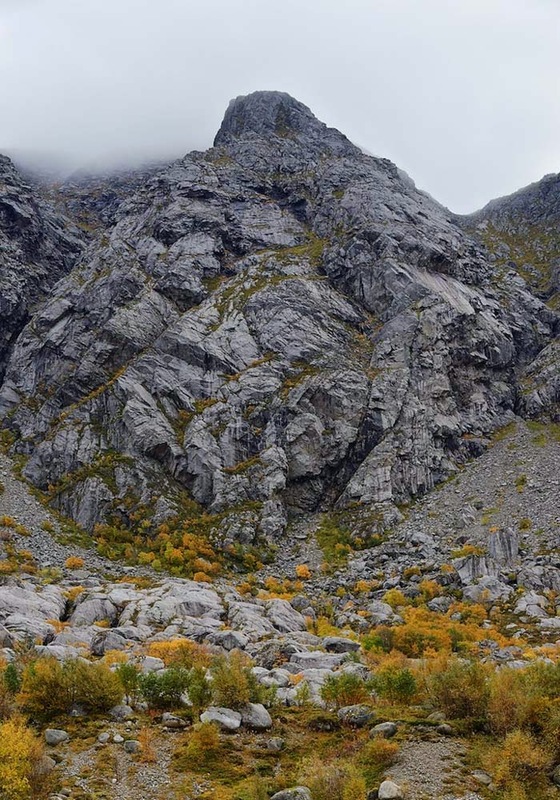 The surrounding landscape remains untouched and wild. 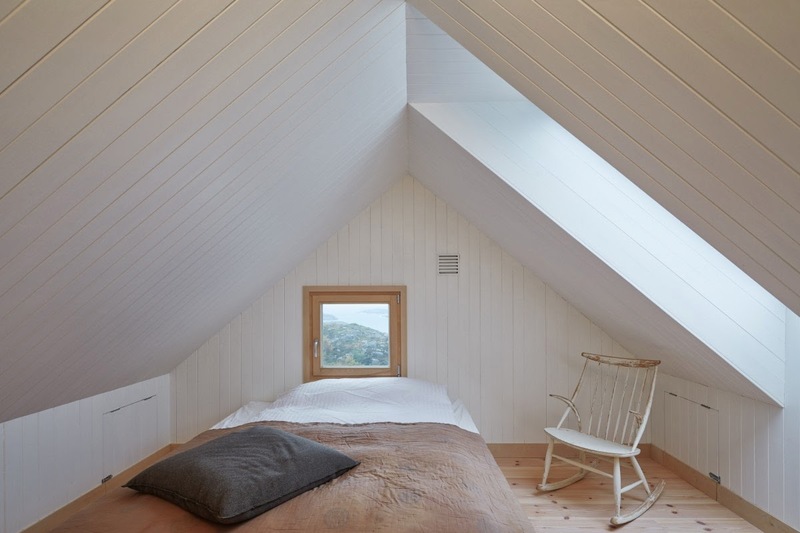 characteristic. 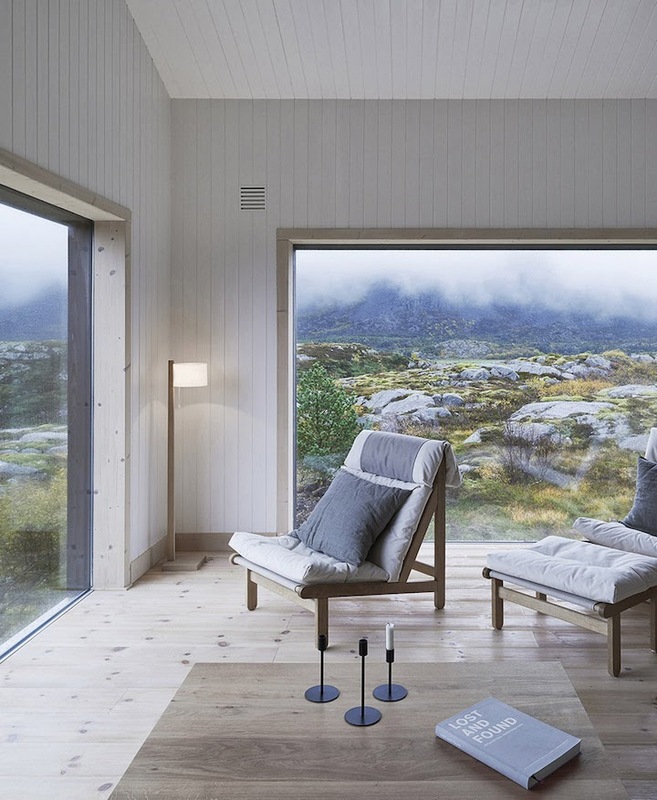 They are simple and robust in detailing and the optically white glass conveys undisturbed frames of the ocean, the mountain range and the bedrock. 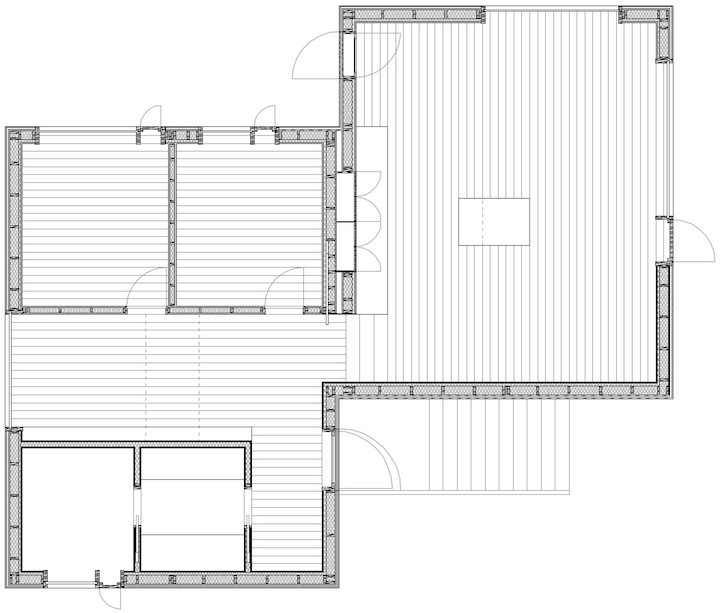 Organised on two levels adapting to the terrain, the plan is compact, providing generous social spaces within a limited floor area. 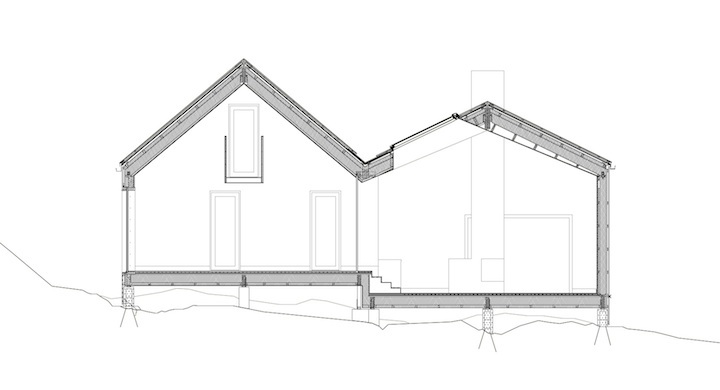 The upper level is comprised of smaller scale bedrooms and family rooms, whereas the lower level is a large gallery-like space structured around a stone hearth. 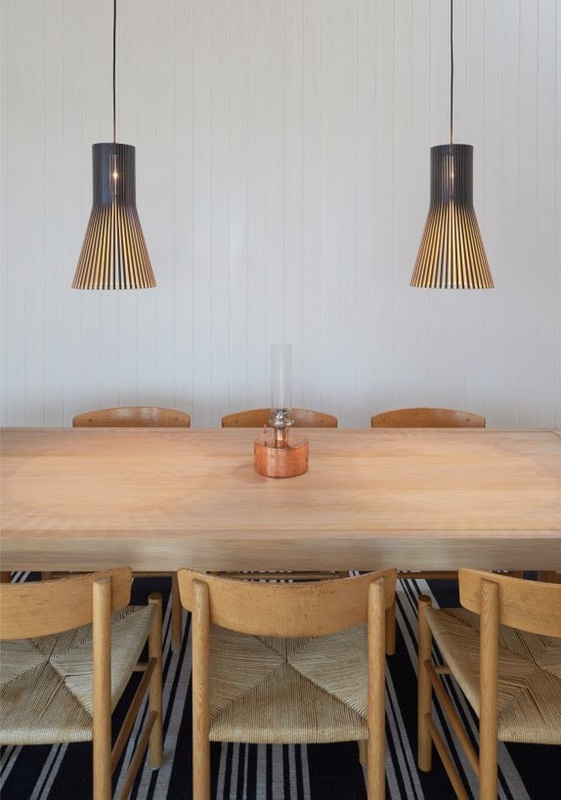 Completed in linseed oil painted pine with untreated birch skirting, frames and reveals – the interior is kept subtle with a character of being hand-built – promoting tactile qualities and the attractive patina developed over time.